The historic La Santísima Trinidad Church in Arroyo Seco and its campo santo, built prior to 1834, was given a place on the official State Register of Cultural Properties in 2009. The Newer church building built in the 60s houses the priest and rectory for the Parish. The parish is currently served by Father Angelo Marquez a young priest from Albuquerque who joined the Arroyo Seco Parish in 2018. From Issue 24 Winter 1997 Taos County Historical Society Publication in an article titled La Santísima Trinidad Parish: A Grand History by Larry Torres. 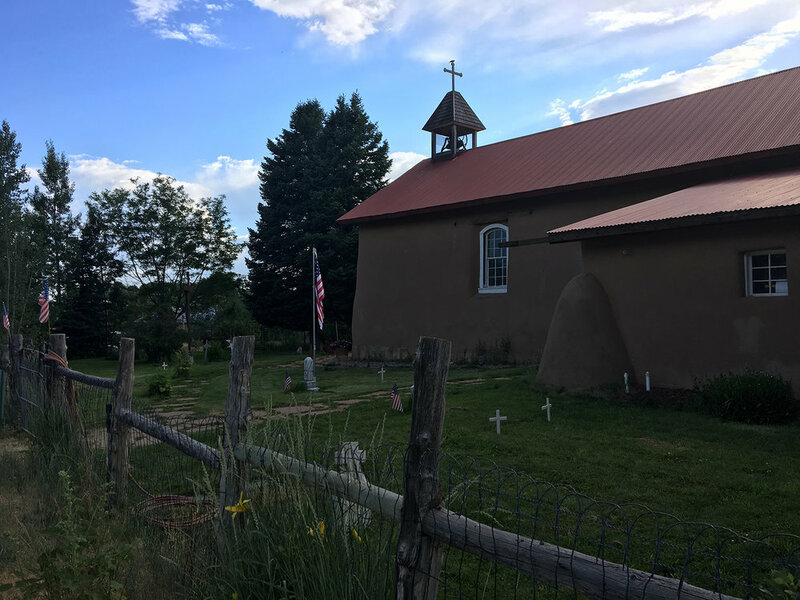 “Nestled among the crags of the Sangre de Cristo Mountains in northern New Mexico is the parish of The Most Holy Trinity. Even before its incorporation as a full parish in 1946, La Parroquia de La Santisima Trinidad, as it is known in the church rosters, was a place of great spirituali­ty and tradition. Local custom points to an oral tradition which recounts a beautiful story in which the Father the Son and the Holy Spirit themselves chose the site in the wilds of Arroyo Seco to be their own home in the early 1800s. “The village of Arroyo Seco, seven miles north of Taos, was begun when its people acquired rights to the lands under a grant made by Joaquín Codallos y Rabal, dated October 7, 1745. As a site, it was first known to be recorded in a chronicle dated 1716. It was deeded to General Lucero de Godoy, who never bothered to settle on the land. The valley lands are nourished by the Río Lucero. For many years, the subsequent settlers of the valley thought the river was named for the general himself. Folk poets of the region, though, offer a different per­spective. In Spanish, the word lucero means "morning star." And indeed, the Río Lucero, which flows down from the mountains of Blue Lake, takes its source from the same location where the morning star (the sun) first peeps over the mountain ranges. Settlement of the area began in 1804 when Cristóbal Martínez and José Gregorio Martínez, from Río Arriba County, planted crops there for the years before building their houses in 1807. According to the Spanish Archives of New Mexico, general land use began in 1815 when more people began to cultivate their lands, which they irrigated from the Arroyo Seco and Río Lucero. By 1824 there was already Hispanic community established there. Archdiocean records show that the church building was already erected by 1834. 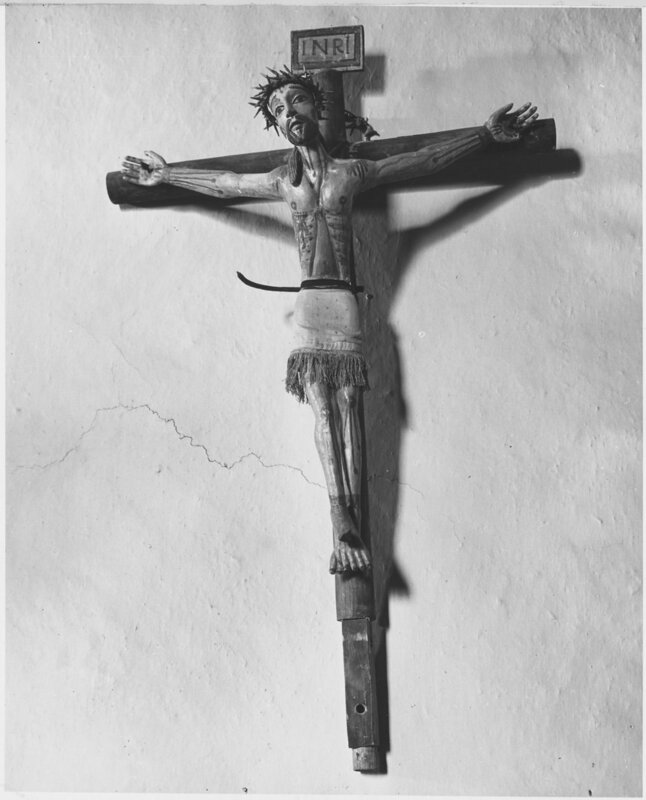 The construction work was done by the families of Los Herrnanos Penitentes de Nuestro Padre Jesús Nazareno. The altar screen, which dates to 1861, was the masterpiece painted by José de García Gonzales, who also executed the altar screens in Trampas, Rodarte, Llano San Juan, and Llano Largo. There exists a legend here in the village as to why the parish is named La Santísima Trinidad. The original Arroyo Seco settlement was not in the area of the cur­rent plaza. It was much higher up, toward the foot of the mountain called El Salto de las Aguas, where the five waterfalls stream down the mountain. Two families from Abiquiu were the original set­tlers in this part of the Taos Valley, which was a dan­gerous crossroads because of the Navajos and Utes who attacked the Taos Pueblo and Spanish settle­ments. The families lived in a large fortified complex at the foot of El Salto. The remains of three torreones can still be seen. The parents would leave the fortified compound during the day to clear the lower fields for cultivation with firm parental instructions to their children to stay within the safety of the walled hacien­da and not go wandering off. The children, being chil­dren, left the protection of their home and wandered down the Río Lucero (Arroyo Seco Creek) where one day they encountered two strange men. Surprised to see men who appeared to be Spanish settlers, the chil­dren asked where the men lived, for they thought they were the only Spanish settlers in this part of the valley. The men responded that they lived further on down the river. When the children asked if the men got frightened, living so exposed in the open of the lower valley, they responded that they were not frightened. And besides, the men said, a white dove lived in the tall trees near them and made loud coo­ing noises whenever anyone approached, thereby serving as a warning of approaching danger. Departing, the children returned home and told their parents of their encounter with the two new neighbors. The parents, knowing they were the only Spanish settlers in this part of the valley, decided to investigate for themselves. The two families walked downriver. Soon, the children spotted the white dove in a tree top. They immediately recognized the bird the two men had told them about. As the bird flew from tree to tree the two families followed it. At last the bird landed in an open area on a large rock and then flew off. The people noticed the rock was some­how different - luminescent. They turned the rock over and discovered an ancient bulto ,or wood carv­ing, of La Santísima Trinidad. When the children spot­ted the bulto they immediately cried out, "Those are the two men we saw!" The families immediately recognized that it was the actual Trinity, God the Father, Son and Spirit (the dove), who had appeared to the children. The current church is built over the site of the rock. The Arroyo Seco Plaza was built around the church, and the ancient bulto is enshrined in a side altar. Church black and white historical images on this page from Wikimedia commons. Irving Rusinow, Photographer, December 1941, photocopied images of Church circa 1900s, and Bulto of La Santísima Trinidad collection of Larry Torres, image of church in summer, Caitlin Legere, 2016.